Gianna New heads toward the cage in Fox Lane’s home game vs. Mahopac last week. 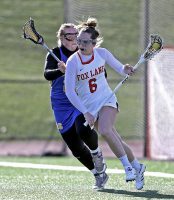 Fox Lane and Mahopac each used scoring streaks to take the lead Thursday afternoon before the visiting Indians scored three goals in the game’s final eight minutes to pull out a wind-blown 11-9 victory over the Foxes. Fox Lane tied the score at 8-8 with 9:29 left in the game on a goal by junior attack Isabel Abt. But Mahopac then scored three consecutive goals to close out the Foxes, whose record dropped to 1-1. Senior attack Giana New scored four goals and her frontline classmate Callie Wortman added two goals for the Foxes. Abt, freshman Quinn Alami and sophomore Natalie Bazyk each added a goal. New had scored seven goals, including the 150th of her varsity career, in the season-opening 12-8 victory over White Plains. Mahopac took a quick 1-0 lead less than a minute into the game before New and Wortman scored five goals between them as the Foxes opened up a 5-2 lead with three minutes remaining in the first half. But the Indians scored twice to cut their deficit to just one goal at the half. The Foxes are coming off last year’s 10-8 season in which they advanced to the Section 1, Class B quarterfinals before losing to Yorktown. The youthful squad is expected to improve as it goes through the season. Fox Lane coach Bill Broggy is learning more about his young team with each practice and game. The Foxes, who feature just five healthy seniors and a large group of underclassmen, opened the season with the convincing win over White Plains before falling to Mahopac. Caroline Raymond scored four goals for Mahopac and controlled the offensive play with her passing and movement behind the net. Gigi Genovese added three goals, including a score that gave the Indians a 9-8 lead with less than nine minutes remaining in the game. Despite the loss to the Indians, Fox Lane did manage to bounce back two days later. With New erupting for nine goals, Bazyk adding four and Wortmann three others, they defeated visiting Clarkstown North 20-9. The Foxes return to action with a game at Bronxville on Wednesday, then host Lakeland/Panas on Saturday afternoon.